6) NEW WAYS TO GIVE! The annual orientation signals the start of a new year at LiveWorkPlay. Although the organization operates 12 months of the year, September traditionally sees the launch of changes made in response to outcomes from Visioning Day in June, and also the introduction of new members to the LiveWorkPlay community. This year's ev ent was hosted on August 27 and saw a record turnout of more than 100, which does not include approximately 15 individuals that attended the first of two volunteer orientation sessions being held this month. Each youth and adult member (and any of their supporters who were in attendance) received a comprehensive 76 page orientation binder detailing available supports and services, community expectations, important dates, and more. The biggest but expected change announced this year was the continued "de-programming" of LiveWorkPlay supports and services. Life is not a program, and too often people with intellectual disabilities are forced into situations where they are just "filling time" to the benefit of others. This is often the result of the well-intentioned efforts of parents, service agencies, and other influences that operate on the faulty assumption that it is best for people with intellectual disabilities to avoid the risks and challenges of community life. But this of course ignores the rewards that come from full citizenship, such as personal dignity, respect, and the enjoyment of all that life has to offer! The new changes will get rolling in September with individual meetings that will help each person develop their own personal plan. 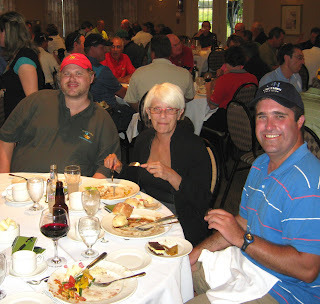 It's not been a very good summer for golf enthusiasts in the Ottawa area, but it was a perfect day for the more than 130 golfers who played 18 holes at ClubLink GreyHawk, all in support of LiveWorkPlay. The combination of fees, donations, sponsorships, and auction bids added up to net proceeds of more than $17,000. Special thanks our major sponsors including Marcomm, Bank of America, and CaTech Systems as well as lead organizers Jack Murphy, Pat McFadden from Quelmec, and Paul Sheldon O.B, Villeneuve. And a big shout out to our course volunteers Ivan Harris, Marlene Burton, Ian Murphy, Warren Murphy, Michael Hinchcliff, Jenny Dobson, and Ryan McBride. We have more than 100 photos and a short video to help express the upbeat mood of the day. 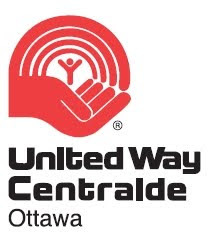 These are very challenging times for charity fundraisers, and many golf tournaments around the city were cancelled this s ummer. LiveWorkPlay is very fortunate to have received such strong support from individuals and business that dug deep to help out. 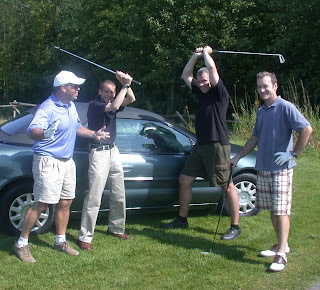 The 2009 tournament raised over $17000 and by a slim margin managed to surpass the previous year's record total! 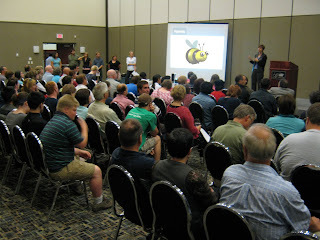 This was thanks in part to first-time event MC Dan Mooney from Rogers TV, who proved to be an excellent auctioneer! 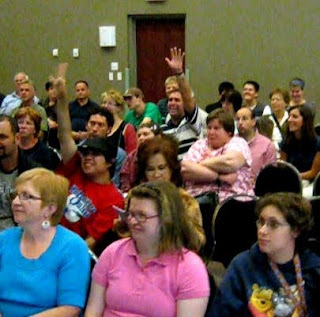 The 2009 Annual General Meeting featured a number of special video tributes to the past and present, and following the themes established at the ori entation that preceded this gathering, the Board of Directors talked about the need to continue the individualization of LiveWorkPlay supports and services. Staff reports revealed many important trends. This includes: 1) growth in employment with 26 adult members currently enjoying paid employment; 2) a broadening of the volunteer team to include more one-on-one opportunities, and growth of the team to more than 25; and, 3) revenues have increased and also diversified. There were many excellent questions from members at the AGM, many focused on concerns raised by and for younger individuals and their families who are not able to access funded government placements, while at the same time promised individualized funding opportunities have yet to materialize. GREAT GEAR WILL SOON DISAPPEAR! The first public sale was at the Orientation on August 27, but a variety of colours, styles, and sizes are still available, please inquire at the LiveWorkPlay office. The hot item for women so far is the embroidered t-shirts, they are going fast. 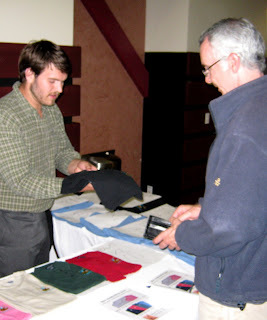 Men are scooping up the golf shirts! Fly your LiveWorkPlay colours soon, because there won't be another order until the spring! 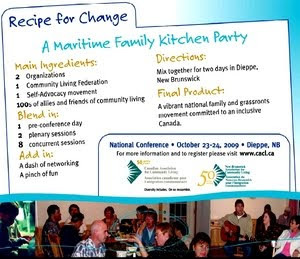 The Canadian Association for Community Living and the New Brunswick Association for Community Living are pleased to co-host a Maritime Family Kitchen Party - A national gathering of families, self-advocates and allies working towards a more inclusive Canada. We'll meet at the Ramada Plaza Crystal Palace in Dieppe, New Brunswick. There are very affordable registration options. LiveWorkPlay may be able to provide transportation to a small group of self-advocates. For more than half a century, families have come together within the Community Living movement to create communities that accept, value, and in clude their sons and daughters with intellectual disabilities. The strength, passion and resilience of families and self-advocates, combined with the commitment of other grassroots community members has driven the changes that we have achieved so far. It is vital that our movement continue to support and nurture the development of our future family leaders — families whose voices will continue to be heard and who will keep leading the way towards communities and a country that fully includes and supports true diversity. Join us in New Brunswick in October 2009 to connect with others, share experiences and strategies and build on the strengths and commitment of families and self-advocates. Bring the whole family. Enjoy the Indoor Amusement Park. Child care options are available. Together we have been and will continue to be a powerful force for change in our world. If you would like to make a donation to LiveWorkPlay, please click here to donate online or use our new PDF donation form which now has options for credit card and pr e-authorized withdrawals. You may also specify how you would like your donation to be used. We hope you have enjoyed this 33rd edition of LiveWorkPlayNews. If you have received an email about this blog in error and/or you would prefer not to receive future LiveWorkPlayNews messages, simply click here and follow the simple instructions. Click here for the web page that can be used by newcomers who would like to join LiveWorkPlayNews. Feel free to share the address with friends, colleagues, and family who might like to subscribe. Send story ideas to Keenan Wellar.